This type of Diabetic diet low in carbohydrates is a good choice to lower blood sugar level. Don’t limit yourself on just an one-side diet. Keep in mind that you should eat from all groups of foods: proteins, carbohydrates, fats, and need to take vitamins and minerals too. All of them you can find in grains, fresh fruits, vegetables, dairies, lean meats. It is true that every human being should follow nature’s laws. And one nature’s law is 70% water and 30% solid and concentrated elements. That’s why mostly recommended are watering foods like fresh fruits, vegetables. It’s a diet that you need to follow in order for you to not raise up your sugar blood level. Instead, it helps you to lower it. 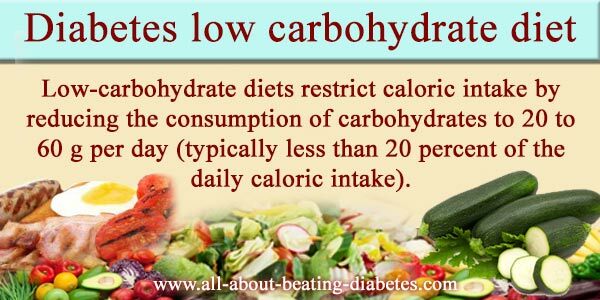 Low-carbohydrate diets restrict caloric intake by reducing the consumption of carbohydrates to 20 to 60 g per day (typically less than 20 percent of the daily caloric intake). The consumption of protein and fat is increased to compensate for part of the calories that formerly came from carbohydrates. It is based on the fact that some carbohydrates are considered to be bad carbohydrates, such as rice, white potatoes, pasta, cereal, peanut butter….etc. these foods can raise your blood glucose levels quickly. The elevated glucose levels will stimulate your body to produce more insulin; high levels of insulin cause you to gain weight as it increases your hunger. Furthermore, if you consume low carbohydrate foods, this will decrease levels of insulin in your blood, so your body will breakdown stored fats to produce energy, eventually, you will lose more weight. However, researchers are still going on to understand the weight loss when using a low carb diet, because the role of the insulin and/or blood is still discussable. Try to balance what you eat with what you need, with your life style, daily activity. When you eat, try to chew slowly the food in your mouth. Avoid quick in-mouth packing food. Plan your meal, and use small plates, so you don’t put everything in it. This is one way to cut your excessive gourmand. But you need to add simple exercises in your daily life planning in order for you the diabetes low carbohydrate diet could work. You can also find out what is the best diabetes diet for you to follow in order to lower your sugar blood level. Who is eligible for low carbohydrate diet? It is important to eat from all types of food for our body to normally function, especially when it comes to diabetics. However, if your doctor wants you to put under a low carb diet or you want to easily and fast losing weight, then this rule is not eligible any more. 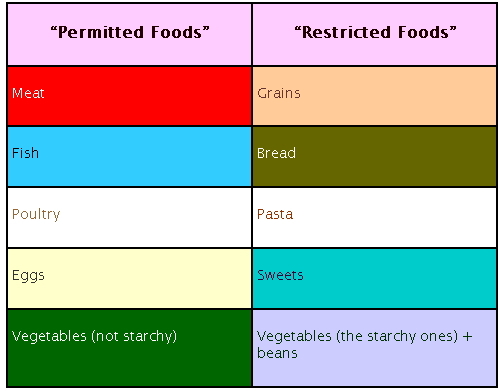 The menu of a low carb diet consist of reduction of high carb foods (bad carb foods) and high in proteins and fats. Recently, there have been a lot of controversies about low-carb diet and its effect on general health. That's why it is good to consult your doctor or any dietitian before deciding to go for this diet. Are you really willing to undertake this diet? Do you really think this diet is better compared to the others you have tried before? Concentrate and think over these issues peacefully!!! researchers have reported that the “weight-loss” will experience during the 1st year, the next 2 years will regain weight. If you tried other diets before on your own, do you need somebody's help? Think it over, and find the right person/s who might sincerely help you!!! Can you really afford the low carbohydrate diet? Choosing “special” foods for your daily need under a low carb diet requires a “full-of-money” pocket? Do you own it? Is it really worthy to spare your money on this diet!!!! Make a check-up before starting. Perhaps you have any disease or condition not known before. Or perhaps you are suffering from any illness and taking treatment. Ask your doctor for your decision to prevent any inconvenience!!!! Low Carbohydrate Diet – for how long? When you follow low carbohydrate diet, you will lose weight effectively in a very short period of time, up to 6 months, and then the amount of weight loss will decrease gradually. However, most of people do not resist too much to the restriction. That's why, after achieving the “first months weight loss”, people usually quit. Furthermore, the “food-industry” is producing lots of tasty and smelly “yummy-teeth-pleasuring” foods that no body could resist. Even one on diet or diabetic. Thus, try to work with yourself against your gluttony to avoid future problems.